I was out and about at Sweetwell Farm for a Zomato Meet Up where the people who work for Zomato gather the people who write reviews for the site, and treat them to a meal at one of the restaurants that advertise on their site. Our meal started with meaty mushrooms served on flatbread with crispy green bacon and a free range, very rich egg. This was served with deliciously sharp tomatoes and a divine honey mustard sauce. We were given three main courses! The first was a pork burger served with scrummy crushed potatoes. The wine paired for this course was a Zevenwacht Pinotage (2013) which was acidic when drunk alone, and soft when sipped with the food. It had a lovely red berry palate. The 3 hour pork belly sadly did not have crispy crackling but thankfully it was succulent. This was paired with the Zevenwacht Bouquet (2014). The litchi and rose on the palate was delightful, and would have paired just as well with the dessert. I had one bite of the slow roasted pickled eisbein as by that stage I had eaten far too much (and I wanted to save space for dessert). 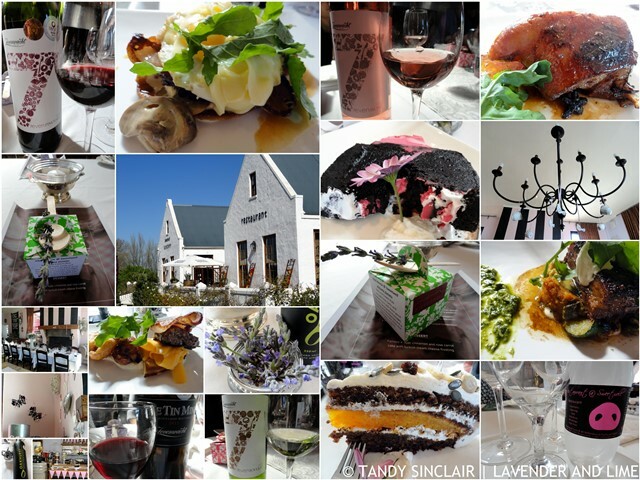 The star anise in this dish worked very well with the wine which was the Zevenwacht Rosé (2015). The strawberry notes in the wine paired wonderfully with the dessert as well. Dessert was a 4 layer cinnamon and rose carrot cake with Turkish cream cheese frosting, hence the fact it would pair so well with both the white and rosé wines we were served. It did not pair very well with the Zevenwacht The Tin Mine (2012) which is an SGM blend redolent with Christmas spice. Sweetwell Farm is a pork farm, with a butchery attached which is well worth a visit, after you have enjoyed a meal. Thank you to Dominique from Zomato for the invitation. 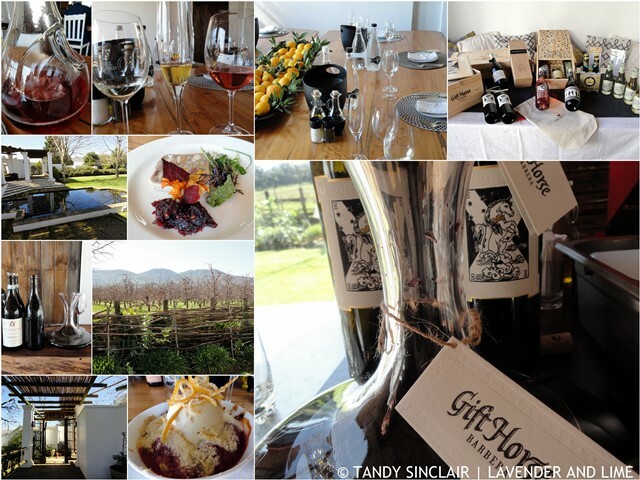 The following day I headed over Sir Lowry’s Pass to Fresh at Paul Cluver. The reason for the lunch was to experience The Gift Horse, Bruce Jack’s exciting wine which represents a life long vision. Our tasting started with the cider collaboration between Paul and Bruce which is reminiscent of prosecco. We then tasted a floral rosé full of rose on the palate before moving on to a wine made from chardonnay grapes, picked fairly unripe and then matured as one would a fino sherry. Despite acidity levels of 8.2%,the wine is not at all acidic and has a delightful peppery taste. These were served with a terrine of guinea fowl, squab pigeon and duck confit. The terrine was very tasty and accompanied by a stunning jam. Bruce is the winemaker at The Drift, and chose to plant the Barbera grapes despite being warned against it. These are a peasant varietal grown most commonly in Italy and have been harvested for wine since the 13th century. Barbera ripen early and will grow well in exposed sites and poor soils. It is the cold weather on the farm that could factor against the grape, but with love and attention, Bruce’s grapes have done quite well. We tasted the 2013 vintage which has been bottled, as well as a barrel tasting of the 2015 harvest. The yields are small, with only 600 – 700 bottles each vintage. The 2013 has herby aromatics and one can sense the buchu on the nose. There are dark fruits on the palate and a hint of chocolate in the finish. This easy drinking wine was highlighted by our meal. The 2015 to me was exciting, with a light herbaceous nose, long legs and a deeper feel of the chocolate on the palate. We were served a lightly smoked Cape salmon and a ceviche of Norwegian salmon to go with the wine. And if you ever thought that red wine and fish do not belong together, you need to try this combination. Before dessert we were given a taste of the Orpens mulled cider which is made in Tipperary. Then to finish we had a slightly sweet, sticky white wine. This went perfectly well with the rhubarb, plum and pear coconut crumble and the orange mulled ice cream. A huge thank you to Skye for the invitation and to Bruce for the bottle of wine I got to take home with me. I look forward to sharing it with close friends. Disclosure: I was invited to these events and I was not asked to blog about them. This post is in line with my blogging policy. Dave and I are overseas in Scotland. I will be back in my office on the 16th of September and I will start replying to comments then. I won’t be able to read any blogs while we are away so please forgive my lack of visiting back. To follow along with us, click here. Ooh Tandy can you please tell me what the Turkish cream cheese frosting was like? I love the sound of that cake! This place offers wonderful food. Did you try everything? Wow – what a meal! This looks absolutely delicious! Sounds like you had a lovely evening. Smoked Cape salmon sounds delicious.